A small fig of lowland rainforests, is often found along edges or in regrowth after disturbance. Petiole and twigs produce a watery milky-yellow exudate when broken. Leaves simple and alternate with blades about 15-35 long x 6-20 cm wide, rough and sandpapery Flat glands are usually visible on the underside of the leaf blade in the forks of the lateral veins and the midrib. Stipules about 0.6-1 cm long, slightly hairy and tapering to a point at the apex. Figs are not actually fruits, but highly modified inflorescences with the tiny flowers contained inside. 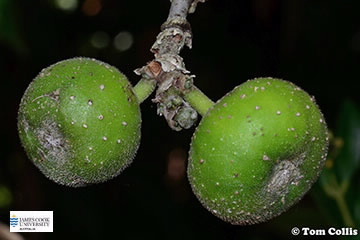 These syconia commonly called “figs” are borne on leafy twigs and on special branches along the trunk, often down to ground level. They are pear-shaped or even disk-like, covered in rough hairs,15-25 x 25-35 mm, ripening yellow. JCU acknowledges the Yirrganydji and Djabugay Peoples for sharing their Indigenous Knowledge and pay respect to the elders past and present. “Known as May-al. Rope or bush string made from tree”.